Description Water pots for washing brushes of this form are named for their shared shape with a beehive or chicken-coop (domed bamboo baskets with a small opening on top for feeding chicks) washers. This washer has a wide round foot, a domed body, and a short, narrow, and gently curved neck for the small rounded opening on top. 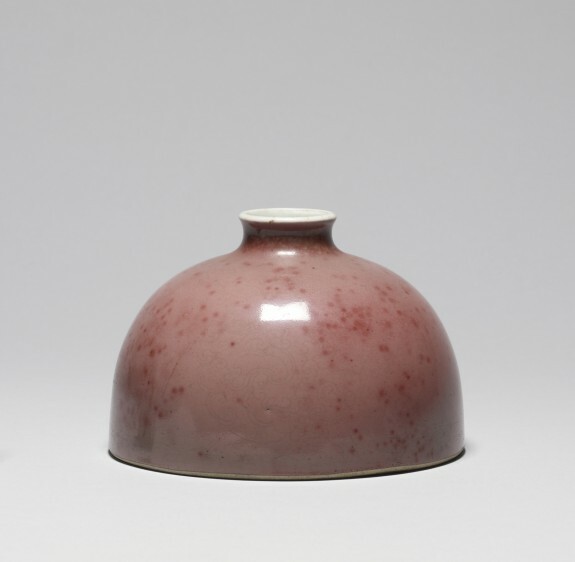 The peach bloom glaze is a soft pink speckled with apple red and a small patch of green on the neck. Three medallions based on archaic designs are incised in the paste of the porcelain beneath the glaze and depict stylized dragons coiled among clouds. The finest of peach bloom wares date to the latter half of the Kangxi reign (1662-1722), produced at the Imperial kilns at Jingdezhen. The glaze's delicate modulation of color suited its application on sets of petite porcelains for the scholar's writing table, including small flower vases, brush washers, and boxes for seal paste. Provenance Acquired by Henry Walters [date and mode of acquisition unknown]; by bequest to Walters Art Museum, 1931.